Although he wasn't considered a Rat Pack member, Johnny Carson was definitely associated with all of the Rat Pack stars. Frank, Dean and Sammy were all repeated guests on The Tonight Show, and Dean's variety show was produced at NBC, very close to Johnny's Tonight Show studio. One classic Tonight Show episode features a mischievous Dean as a guest along with Bob Hope and comedian George Gobel. Johnny was also a guest on Dean's show, and was roasted on The Dean Martin Roasts. And Joey Bishop, who competed with Johnny at one point with his own late night talk show, was also a frequent guest host for Johnny. Frank guest hosted for Johnny one time as well. But the closest association of Johnny with The Rat Pack was when he filled in for an ailing Joey Bishop at a charity benefit in St. Louis for an organization called Dismas House, a halfway house for ex-convicts. The event, which took place on June 20th, 1965, was filmed and later released on video, featuring Johnny emceeing, and joining in during the musical finale. . .with some surprisingly good singing. 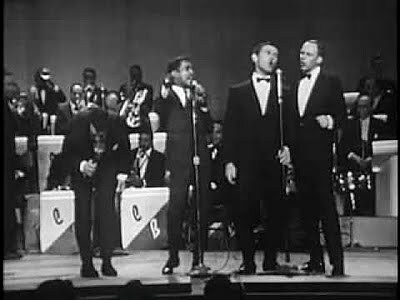 The rundown of that show, featuring Dean opening, followed by Sammy and then Frank is often re-created by today's Rat Pack Tribute shows. "Johnny Carson and The Rat Pack"